Since today is Veteran’s Day (oh, happy day brother and step-dad! ), and because every single holiday is observed in American Samoa, we had the day off. We decided to spend it with our lovely neighbor, Leafa, and a local legend, Saunoa (who is a Vietnam vet, so… dual purpose fun). Saunoa picked us up at 6:30 and soon we found ourselves in Fiti’uta (the village on the other side of the island that is only about 7 miles away but that we very rarely go to since we don’t have a car). He wanted to take us to see the bat “cave,” which is really just a very large crater in which several hundred bats live. (Samoan fruit bats, also sometimes called flying foxes.) We’ve heard awesome things about this bat cave–that the treetops are nearly black from the blanket of bats, that the bats rise all together in a wave of majestic batty-ness, that you will never recover from the beauty of a moment so few living people have witnessed, etc, etc. We walked the steep mountain trail to the crater, but there were no bats. Saunoa was baffled (batfled? is that too much?) He had never seen the crater devoid of bats. We decided to hike a little farther to another crater. Maybe the bats moved? But still no bats. We were trying to solve the mystery of their disappearance when we noticed another, newly-created and freshly-blazed trail. And then we sort of forgot about the bats. Our mutual curiosity took us up the new trail, where we found all kinds of interesting things to look at and plants we didn’t know were up there (but no bats). We hiked a little bit more. Just when we were about to stop, the trail came out on a wide rocky path that looked like it was created by water, and which we then referred to as “the river.” We stopped and had a little lunch to enjoy the view. We were covered in mud and I was being eaten alive by mosquitoes, but it was fully worth it. Five mosquitoes feasting on my calf. Leafa found a tree on the mountain that she and Saunoa had never seen in American Samoa. That was pretty cool. Then Saunoa thought maybe there would be a water source a little higher up. So, we hiked up a little more in search of it. And then a little more. And a little more. We followed the trail from the rocky path (er, the river) until we found ourselves nearly to the top of Mt. Lata, the highest peak in American Samoa. The Beard and I have been trying to do the Mt. Lata hike since 2011, but we’ve never been able to get a ride over to Fiti’uta. And then today we did it accidentally (well… most of it). Unfortunately, the path stopped abruptly just shy of the ridge, and the jungle brush was far too thick to keep going (even though we did have a machete with us, it was just too much jungle). So Saunoa knocked a few notches in a tree at the end of the trail for posterity’s sake and we headed back down the mountain. It was both super fantastic and fairly disappointing to finally hike Mt. Lata (and not even on purpose) but have to stop so close to the top. Alas, we are planning to go back sometime before we leave. Besides, we still have to find the bats. Here are some more photos from the hike. 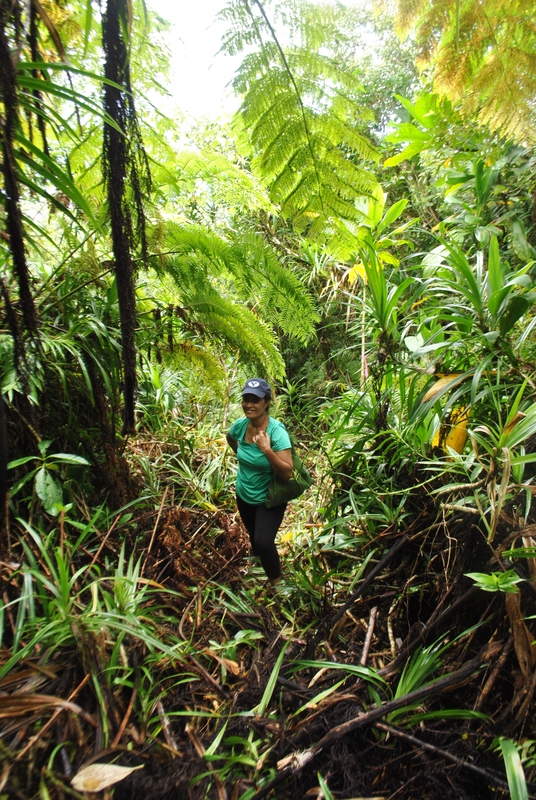 Totally possible that Leafa is the only Samoan woman on this island who has ever hiked Lata. She’s amazing. yea, another silver fern shot. sowhut they’re the best. The best thing about this hike was who we were hiking with. Leafa and Saunoa were excellent companions and guides. Saunoa spent much of the hike pointing out flora and explaining traditional uses of different plants. Leafa’s excitement about being there was contagious. (We joked about it a lot on the trail but it could very well be true that Leafa is the only Samoan woman alive to have hiked up Mt. Lata.) Most people in the villages, and especially the women, never go up the mountain.) Just two years ago, Leafa couldn’t even think about doing this hike. But thanks to God almighty, she is well enough today to climb a muddy rainforest mountain. Just amazing. Plus, I enjoy small groups the most when I’m hiking–I love the occasional conversation but prefer the comfortable silences more than anything. (There’s nothing worse than a cacophony of loud voices when you’re trying to enjoy a quiet forest landscape.) We couldn’t have planned a better day. The Beard and I have been trying to hike in Fiti’uta for so long, but it was worth the wait to go in the company of two of our favorite people on the island. This entry was posted in American Samoa and tagged american samoa, day hike, hiking, manu'a islands, south pacific islands, ta'u, travel. Bookmark the permalink. Tom that works for Inter-Island, His son Koli can help you hike anything on Manu’a. He was born in Tonga, but knows his way around Fitiuta better than anyone else on island.